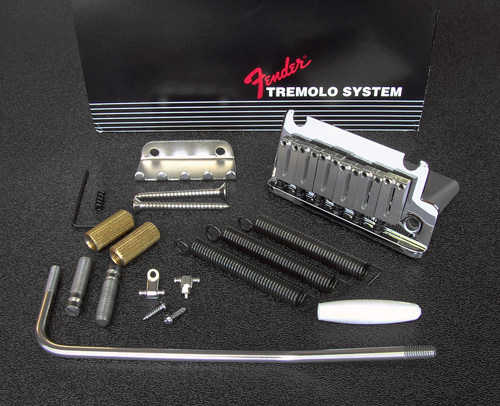 Genuine Fender® American Standard Stratocaster® Tremolo Bridge Assembly comes complete with individual adjustable brushed chrome string saddles mounted on a smooth, low-profile steel bridge assembly. All necessary parts included: pivot pins, mounting bushings, 3 tremolo springs, tremolo claw, tremolo claw mounting screws, two string trees with mounting screws, tremolo arm with plastic tip, tremolo arm tension spring and hex wrench for saddle height adjustments. Saddle string spacing width of 2-1/16".